May 6th, 2004 – John Howard tries to kill off renewable energy in Australia. 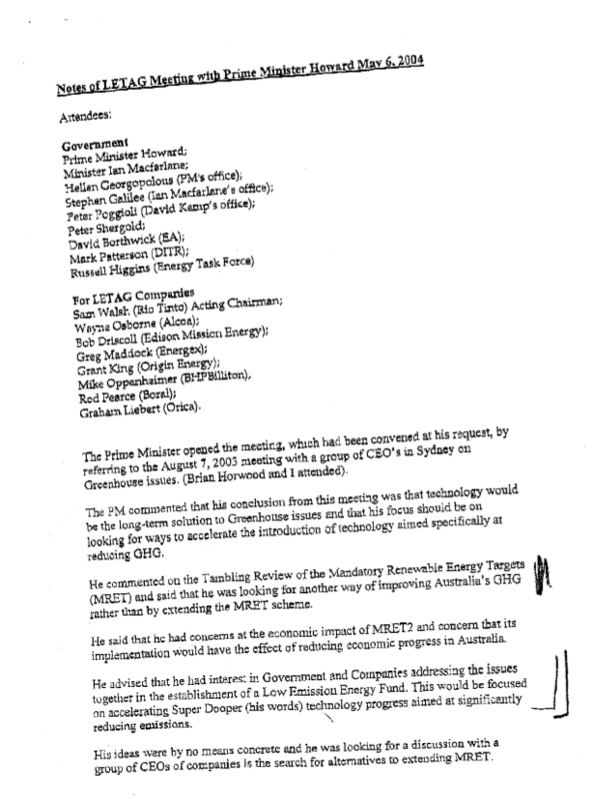 On 6 May 2004 the Prime Minster convened a meeting of LETAG, the Lower Emissions Technology Advisory Group, which consists of the CEOs of the major fossil-fuel corporations. The companies around the table were Rio Tinto, Edison Mission Energy, BPH-Billiton, Alcoa, Energex, Origin Energy, Boral and Orica. These are the companies behind the lobby groups that make up the greenhouse mafia. Meetings like these are never publicised, but we know about this one because private notes made by Sam Walsh, chief executive of Rio Tinto’s iron ore division, were leaked. The notes, which came to light a year or so after the meeting, provide another extraordinary insight into how climate change policy is really made under the Howard Government. The industry minister Ian Macfarlane stressed the need for absolute confidentiality, saying that if the renewable energy industry knew they were meeting, ‘there would be a huge outcry’. He chided the fossil-fuel companies for being insufficiently vocal, allowing the renewables industry to set the agenda, which had ‘got away from us’. Here ‘us’ meant the alliance between the Government and the polluting companies. The Prime Minister told the highly select group that his Government was in political trouble over greenhouse policy, as it was being outmanoeuvred by the NSW government and by the Labour Opposition led by Mark Latham, who was benefiting politically from his promise to ratify the Kyoto Protocol and support the renewable energy industries. There was an election coming up, he said, and the media, especially The Sydney Morning Herald, ‘had created a problem for Government;, so he had called the meeting to get some ideas about how the Government could beef up its greenhouse credentials in a way that could convince the Herald that it was serious about climate change. The Prime Minister also said he was worried about the Tambling Review of the Mandatory Renewable Energy Target (MRET), which had cautiously recommended extending a renewable energy investment scheme. Minister Macfarlane said that the review had ‘found that the scheme worked too well and investment in renewables was running ahead of the original planning.’ The Government was looking for an alternative so that it could kill off MRET, which they believed, was ‘skewed to Wind Power.’ According to the leaked notes, the Prime Minister said that ‘it was not credible to ignore the Tambling Report unactioned [it was tabled in January] and there was a real need to propose alternatives to extending MRET’. He said that he was ‘keen to protect Industry,’ by which, of course, he meant the fossil fuel-based industries, at the expense of the renewable and energy efficiency industries. The renewable sector had boomed briefly in response to MRET. The Prime Minister proposed a Low Emission Technology Demonstration Fund to support technological developments, with $1.5 billion to be funded jointly by Government and industry. Most of the corporate heads responded to this proposal by arguing that it would be much better, Prime Minister, if all of the money came from Government. They issued the usual warnings about companies shifting offshore if any carbon levy were to be imposed.